October 04. 2011 | By Sadia H.
You know when you meet someone and you fall for them instantly? When everything they say, and how they say it, makes your world transform so dramatically that Inception looks like a student film? But then that person fades out of your life for some reason. It’s not anyone’s fault really…it’s just that you kinda part ways. But then years later you run into each other, and once again your world is flipped. Well, that’s just happened to me with Loney, Dear‘s Hall Music. The latest album from the Swedish songwriter Emil Svanangen captivates you so sweetly that you don’t mind being held hostage for little while. From the first line of the first track, “Name,” he’s got you. He subtly nabs your attention with a trail of low and tranquil tones. Then each following track entices you more as the sounds begin to dilate and shimmer with an array of instruments whose sole purpose is to charm you. By the time you hear him serenade “Slow down, there’s nothing after you.” on “Calm Down,” you’re a goner. And you’ve found yourself in the most satisfying state of captivity. 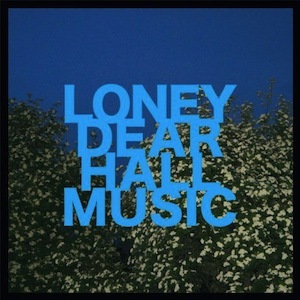 This isn’t the first album where Loney, Dear has lured me in. 2007’s Loney, Noir and 2009’s Dear John kept me occupied for quite some time, but Hall Music brings a new element to Svanangen’s style that give it an even stronger appeal. I’m definitely no stranger to Loney, Dear‘s charms, but never have I fell victim to them so quickly…or so willingly. Stockholm syndrome’s really not so bad.